Modern Machine Shop 77 INTRODUCTION belong to this industry. Those of us who produce MMS work for Gardner Business Media, the same family company that began by launching this book. And at the encouragement of the owners of this company, we give our primary sense of allegiance to metalworking rather than to our own field of media or publishing. The business philosophy of Gardner and MMS has always been this: Focus on manufacturing—aim simply to be of greater and greater use to manufacturers—and success will come. It has worked so far. 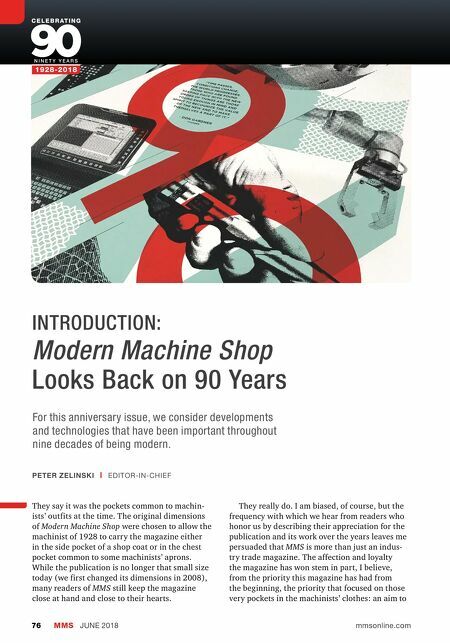 The issue you are holding marks 90 years of Modern Machine Shop. We wanted to observe the milestone. Enough of us involved with MMS have long-enough tenure that we remember the 75th and 80th anniversaries, which we allowed to pass only lightly considered. We wanted to do better this year, but how? Should we look back at major developments of the magazine? The prob- lem with that approach is the developments we would be apt to choose—special issues, changes in media, transitions on the editorial team—would seem significant to us, the staff. The MMS reader experiences different milestones with the maga- zine. They relate to ideas explored and technol- ogies adopted because of what the reader found in its pages. We never get to know which specific magazine issues offer the breakthroughs for our readers because the important discoveries, the right ideas that come at just the right time, are different for every shop. What our readers appreciate about MMS and what they benefit from are its regular issues. So that is the way to look back. In a special collection of articles in the pages to follow, we look beyond just epochal or event-defining issues of the magazine. 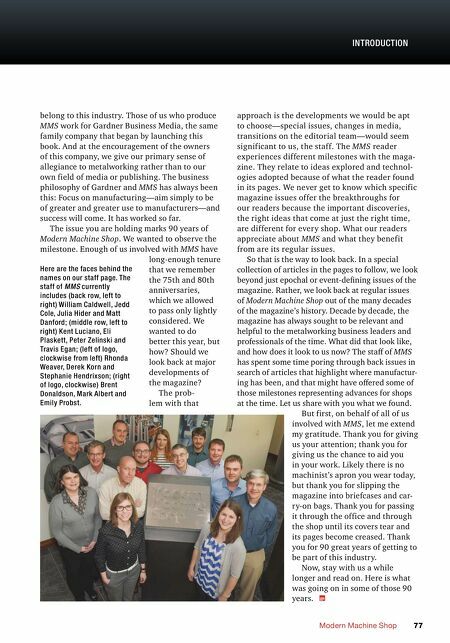 Rather, we look back at regular issues of Modern Machine Shop out of the many decades of the magazine's history. Decade by decade, the magazine has always sought to be relevant and helpful to the metalworking business leaders and professionals of the time. What did that look like, and how does it look to us now? The staff of MMS has spent some time poring through back issues in search of articles that highlight where manufactur- ing has been, and that might have offered some of those milestones representing advances for shops at the time. Let us share with you what we found. But first, on behalf of all of us involved with MMS, let me extend my gratitude. Thank you for giving us your attention; thank you for giving us the chance to aid you in your work. Likely there is no machinist's apron you wear today, but thank you for slipping the magazine into briefcases and car- ry-on bags. Thank you for passing it through the office and through the shop until its covers tear and its pages become creased. Thank you for 90 great years of getting to be part of this industry. Now, stay with us a while longer and read on. Here is what was going on in some of those 90 years. Here are the faces behind the names on our staff page. The staff of MMS currently includes (back row, left to right) William Caldwell, Jedd Cole, Julia Hider and Matt Danford; (middle row, left to right) Kent Luciano, Eli Plaskett, Peter Zelinski and Travis Egan; (left of logo, clockwise from left) Rhonda Weaver, Derek Korn and Stephanie Hendrixson; (right of logo, clockwise) Brent Donaldson, Mark Albert and Emily Probst.